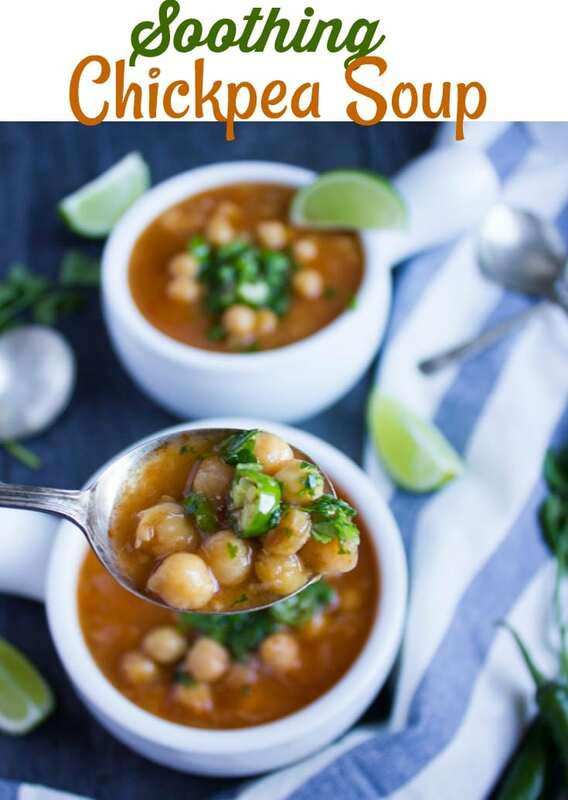 This soothing, comforting and healthy chickpea soup recipe is sponsored by my friends at USA Pulses and Pulse Canada. All opinions and thoughts are my own. Before I get into this one of a kind chickpea soup recipe, I wanted to mention quickly how I LOVE pulses (chickpeas, beans, lentils, and dry peas). If you’ve been following my blog, you probably already know that. It’s almost like my immediate answer whenever someone asks me how to make their meals healthier. Even your average, everyday salad will get a huge nutritional boost by adding pulses! 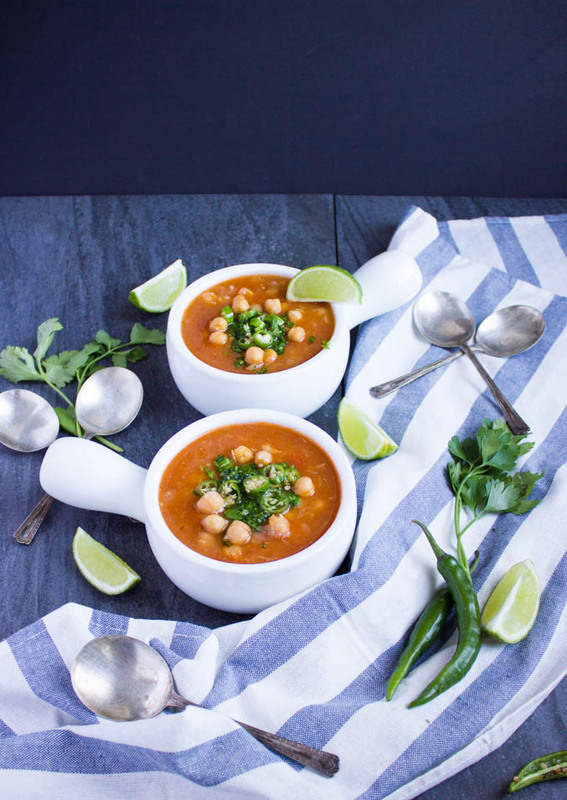 This one pot, easy Soothing Garlic Chickpea Soup recipe is beyond delicious – it’s pure LOVE. 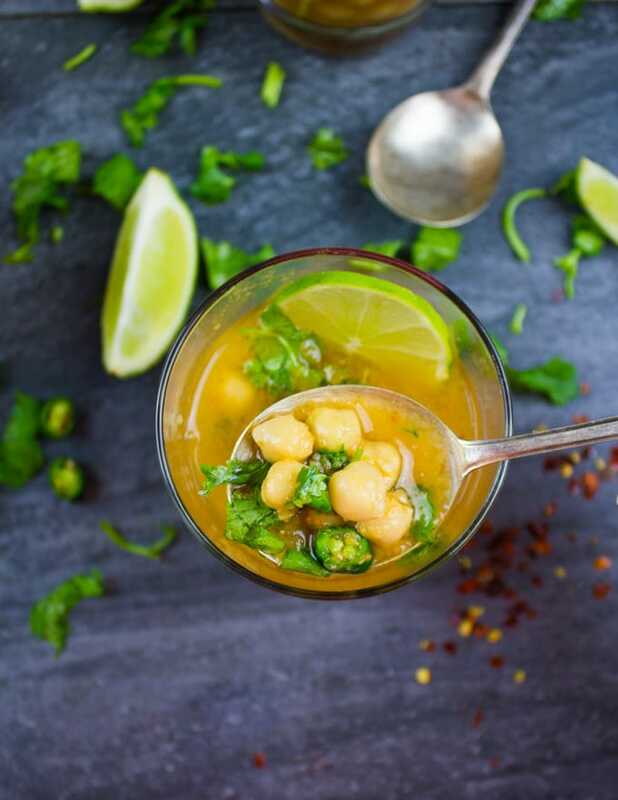 Imagine melt in your mouth cooked chickpeas, infused with a garlicky tomato broth and dressed up with plenty of lime juice, fresh herbs, and some chili peppers. 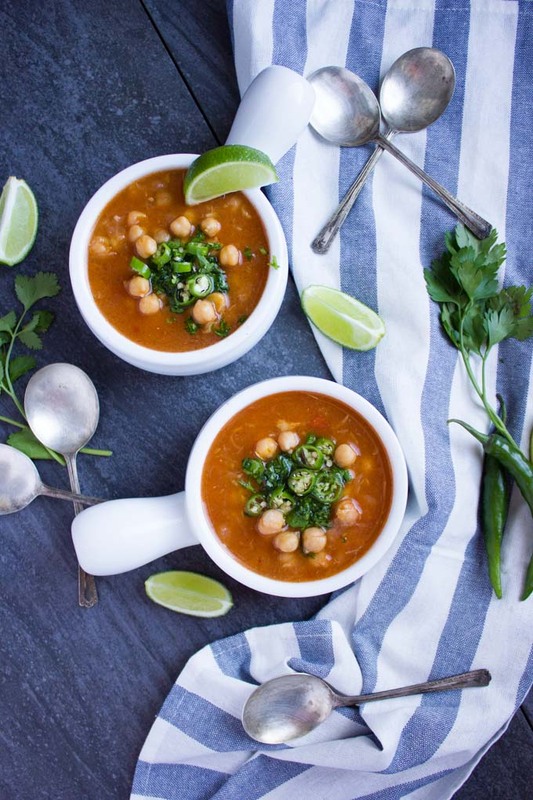 This chickpea soup recipe is proof of the versatility of pulses! Pulses can be used in so many dishes! Even something like this Mexican Style Detox Salad or Balsamic Kale Quinoa Chickpea Protein Bowl. Another favorite and a hit at my cooking classes is this Spicy Vegan Chickpea Moroccan Couscous recipe. But salads and main dishes are not all I use pulses for! Do you remember this Cauliflower Hazelnut Pear Soup recipe? The secret to making my soups thick and creamy minus the heavy cream is adding white navy beans. If you want even more ways to use pulses this year, the Half-Cup Habit is for you! All you have to do is add a half cup of pulses into your diet three times a week – easy peasy. Pulses can be used endlessly and they add SO MUCH to your average meal. They boost up the nutritional value adding plenty of protein and fiber. Also, they add a hearty feel so a simple salad or soup can really fill you up for a while! Above all, they add so much taste and texture! So start by the Half-Cup Habit three times a week, and go up to once a day! Now back to Miami, OMG this year has been so COLD everywhere! I don’t know if I’m getting older, or if I’m getting the itch to move back to Miami! All I certainly know is that I have less tolerance for winter year after year. 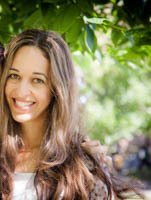 Probably the only thing that gets me through would be soothing and comforting foods—like today’s chickpea soup! I wish I could take credit for coming up with such a simple recipe, but the truth is it’s classic Turkish and Egyptian winter street food! I remember when I was a kid and visited my grandparents in winter, this chickpea soup would be sold at every corner. It’s like the food trucks in NYC. It was like food for the soul. Healthy, filling, delicious, melt in your mouth chickpeas, flavorful, comforting and seriously soothing. While I mentioned this a few times, I can’t stress enough how you’ll be surprised at how delicious these simple ingredients blend together. Here’s basically how easy this chickpea soup comes together. First of all, cook your chickpeas with a whole onion, peeled. If you have an instant pot, slow cooker, pressure cooker, any of those work fabulously! If not, you can cook the chickpeas on your good old stove. The onion here adds a nice depth of flavor to the chickpeas, but not a strong one. So it’s important to leave the onion whole—not sliced or chopped. Once the chickpeas are cooked, you’ll drain them and save the water. In the same pot, you’ll sauté plenty of garlic in some olive oil, add in fresh grated tomatoes or crushed canned tomatoes, some cumin and the chickpea water. Finally, you’ll add the chickpeas and let them simmer in this garlic tomato broth for at least half an hour. Now for the final step: Squirt in some lime juice, throw in some fresh chopped parsley and cilantro, and finish off with some chopped green chili or jalapeños. While the spicy chili is absolutely optional, I highly recommend it! You probably need just a small hint of spice, no more. Now you’re in for a treat!! 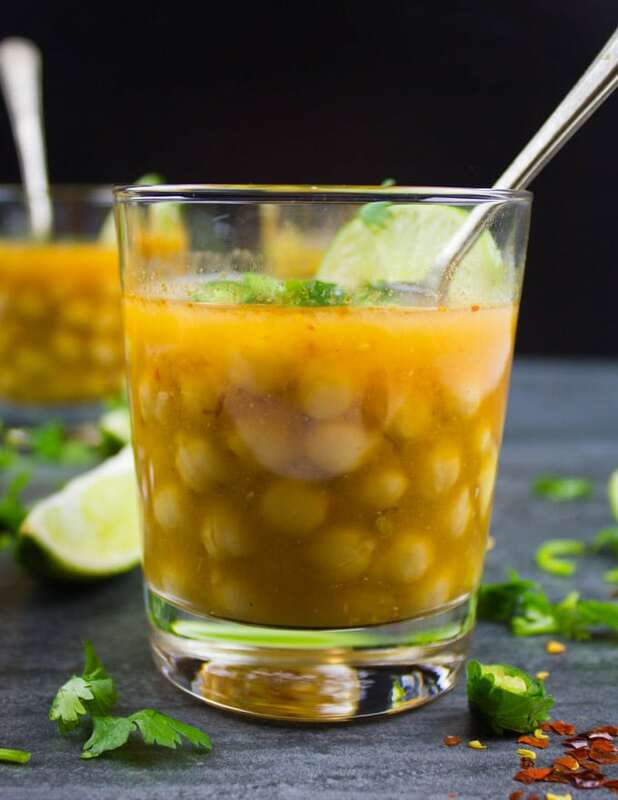 Just one sip and you get all these amazing flavors with creamy, smooth cooked chickpeas. The sliced green chili and chopped cilantro on top are absolutely optional, yet I highly recommend it as it just rounds up the whole dish and adds just the right amount of heat! As a shortcut, you can cook the dried chickpeas in an instant pot but it also works on a traditional stovetop. 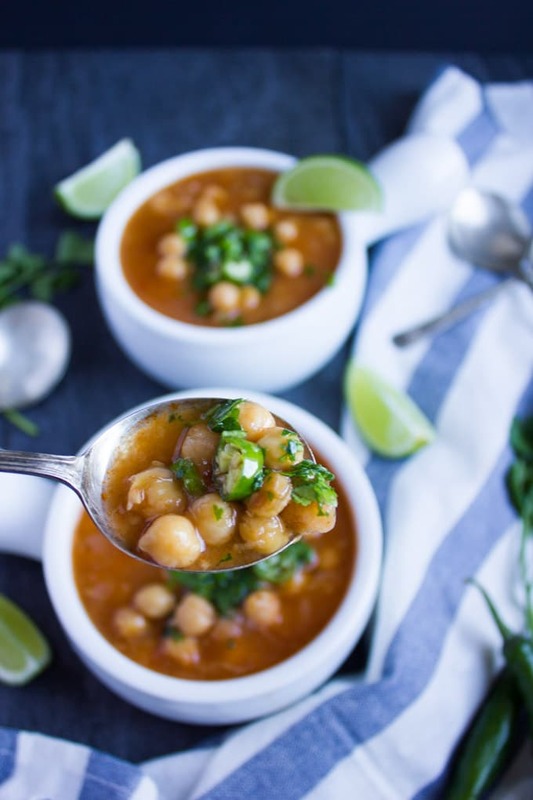 If you didn’t find any fresh limes, use lemon juice instead but don’t leave this part out as it adds a wonderful freshness and pleasant acidity which is essential to this chickpea soup. 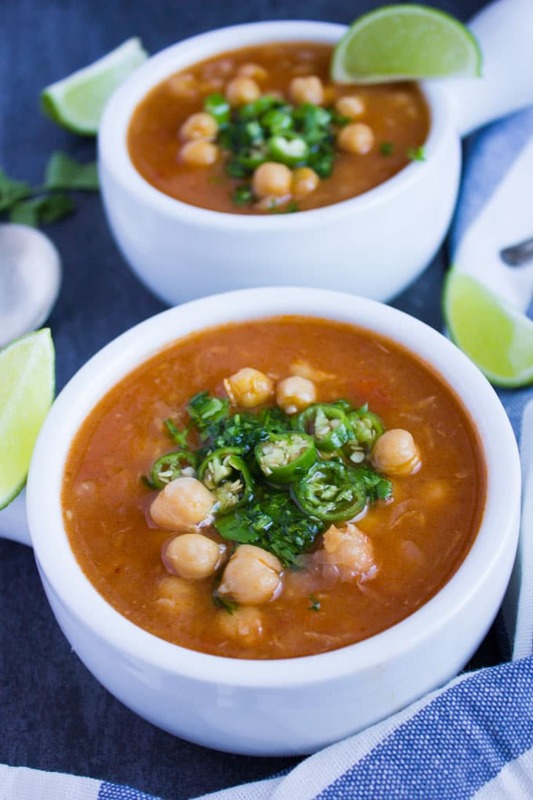 This easy, one-pot Soothing Garlic Chickpea Soup recipe is beyond delicious. 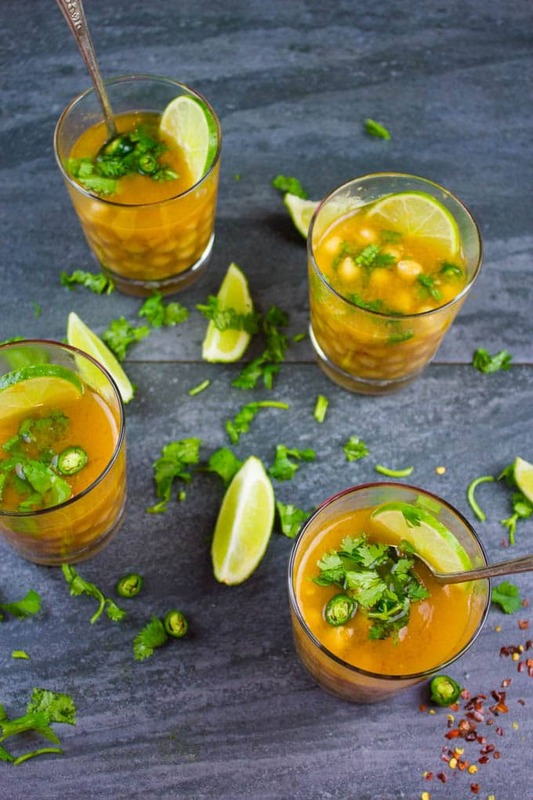 Picture melt in your mouth cooked chickpeas in a garlicky tomato broth and finished off with plenty of lime juice, fresh cilantro, and some chili peppers. Cook the chickpeas with the water and the whole onion until the chickpeas are soft and melt in your mouth. You can cook the chickpeas in the stovetop, slow cooker, instant pot, pressure cooker or any way you prefer. Salt the chickpeas when it’s cooked. Strain the cooked chickpea, saving the chickpea water and discard the onion. In the same pot, over medium heat, add the olive oil and sauté the garlic for a few minutes until nearly golden and add the tomatoes. Stir the tomatoes for a minute until it warms up and then add in the cooked chickpeas, some of the reserved water and allow that to simmer for at least 30 minutes. Feel free to add extra water if you need and adjust the salt to your taste. 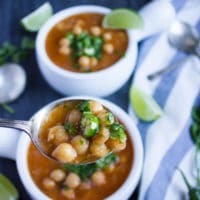 If you didn't find any fresh limes, use lemon juice instead but don't leave this part out as it adds a wonderful freshness and pleasant acidity which is essential to this chickpea soup. where is the recipe? I see the ingredient list but no recipe.